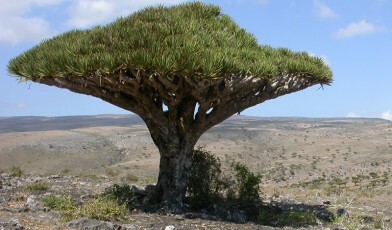 The Socotra dragon tree is an iconic tree with a long history of commercial use. It is known only from the island of Socotra, Yemen, where it lives within remnants of prehistoric ‘Dragonsblood’ forest on granite mountains and limestone plateaus. The island of Socotra’s 34-million-year separation from mainland Arabia has given rise to a unique flora – 37% of its plant species are found nowhere else. The monsoon season brings these areas cloud, drizzle and sea mists – and the dragon trees’ leaves intercept this airborne moisture, channelling it towards root systems shaded by a dense, umbrella-shaped canopy. The dragon tree’s strange looks and ancient age belie a species expertly adapted to its environment. This remarkable tree has been economically important for centuries. Local people value it as food for livestock: feeding very small quantities of berries to cows and goats improves their health, though they cause sickness in excess. The tree is perhaps best known for the red resin it is named after. Known to Socotris as ‘emzoloh’, this has a range of traditional medicinal uses. Referred to by the ancients as ‘cinnabar’, it was well known in trade before 60AD; and the dye ‘dragon’s blood’ is thought to have been responsible for the intense colour of Stradivarius violins. Despite all this, the future of the species is uncertain. Few populations are regenerating naturally, and in some areas young trees lack the species’ characteristic umbrella shape. The most significant problem is climate change: Socotra is drying out, with once reliable monsoon weather becoming patchy and irregular. The tree can expect to lose 45% of its potential habitat by 2080, and while expanding the Skund Nature Sanctuary could protect two potential refuge areas, this level of conservation work will not save the species. Unless major steps are taken to mitigate climate change soon, the future of Socotra’s iconic and ancient Dragon tree – along with countless other species around the world – is very much in doubt.